Rice and meat, served up "Royally". Shahi stands for anything royal and this pallau is topped with fruit and nuts to make it just that. For those who just turned up their nose, it is optional to add these. It is just as delectable without. It is a wonderful party dish and can be quite the pièce de ré·sis·tance to any lavish buffet. The meat in its thick gravy can be prepared days ahead while the rice can be freshly prepared to assemble it on the day off. Isn't this inviting? It is a delightful pallau that will leave your guests pleased as punch. 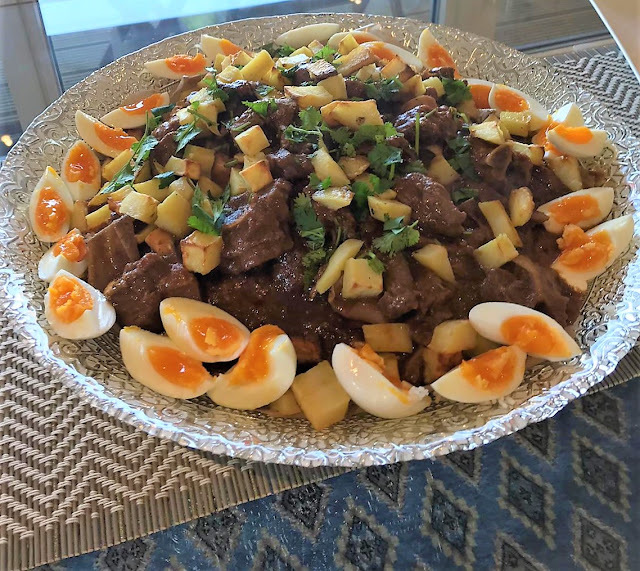 Shahi Pallau showing the rice layer beneath the meat and potatoes. In a pan brown the meat for a few minutes. Add the onions, garlic, ginger, salt, red chilli powder and mix it well. Add the crushed tomatoes and bring it to a boil. Add 2 cups of water, bring it again to a boil, lower the heat. Cover the pan and cook for an hour. Or until the meat is cooked and soft. Lastly sprinkle it with garam masala, mix well. Simmer for 10 minutes before preparing to assemble. In the meantime prepare the rice. Wash and cook the rice in broth. To assemble place the rice, top with the yogurt, top with the meat and thick gravy. Sprinkle with corriander, almonds, kishmish, eggs and potatoes. Use the bones from the meat to make your own broth. The yogurt can be layered or mixed into the rice while warm. If your family like bone-in meat go ahead and put some in. The potatoes and eggs are optional. 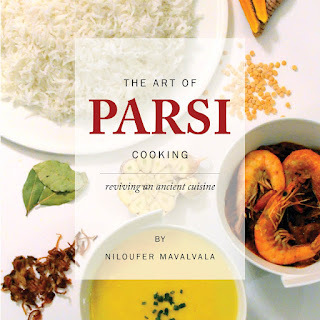 For Parsi Food recipes click on The Art of Parsi Cooking; reviving an ancient cuisine.